Many gardeners wonder what exactly organic gardening means. The simple answer is that organic gardeners don't use synthetic fertilizers or pesticides on their plants. But gardening organically is much more than what you don't do. When you garden organically, you think of your plants as part of a whole system within Nature that starts in the soil and includes the water supply, people, wildlife and even insects. An organic gardener strives to work in harmony with natural systems and to minimize and continually replenish any resources the garden consumes. 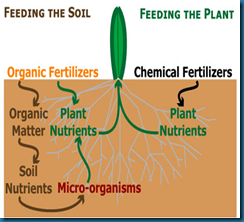 Organic gardening, begins with attention to the soil. You regularly add organic matter to the soil, using locally available resources wherever possible. And everyone has access to the raw ingredients of organic matter, because your lawn, garden and kitchen produce them everyday. Decaying plant wastes, such as grass clippings, fall leaves and vegetable scraps from your kitchen, are the building blocks of compost, the ideal organic matter for your garden soil. If you add compost to your soil, you're already well on your way to raising a beautiful, healthy garden organically. Air. Like most living things, the bacteria that decompose organic matter, and the other creatures that make up the compost ecosystem, need air. Compost scientists say compost piles need porosity—the ability for air to move into the pile. I like to think of porosity in terms of fluffiness. A fluffy pile has plenty of spaces—or pores—for air to move about. A flat, matted pile of, say, grass clippings does not. Even fluffy piles compress during the composting process. Occasionally turning your pile refluffs the material, moves new material into the center, and helps improve air flow into the pile, says Craig Cogger, Ph.D., extension soil scientist at Washington State University. Water. Compost microbes also need the right amount of water. Too much moisture reduces airflow, causes temperatures to fall, and can make the pile smell; too little water slows decomposition and prevents the pile from heating. Conventional wisdom says that compost should feel like a wrung-out sponge, says Abigail Maynard, Ph.D., agricultural scientist at the Connecticut Agriculture Experiment Station. Carbon ingredients. The microbes that break down organic matter use carbon as an energy source. Ingredients with a high percentage of carbon are usually dry and brown or yellow in color. The most common high-carbon ingredients are leaves, straw, and corn stalks. Sometimes people call these ingredients browns. Nitrogen ingredients. Microbes need nitrogen for the proteins that build their tiny bodies. Ingredients high in nitrogen are generally green, moist plant matter, such as leaves, or an animal by-product, such as manure. These ingredients are called greens, but in reality they can be green, brown, and all colors in between. Have a personal cause or interest? You can post any helpful comments on our site and we'll help spread the word! The following is some awesome input from a contributor Cassandra Truax: at Texas Red Worms. Worm composting uses worms to transform kitchen scraps and newspaper into a very high quality compost. It can be done in very small spaces or through communal efforts. It reduces waste going to the landfill and supports biodiversity and organic matter in the soil. 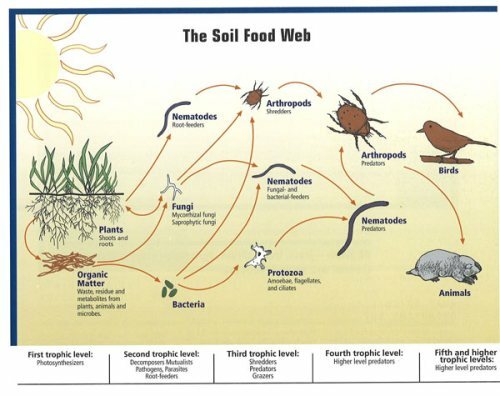 Healthy soil sequesters carbon and holds water. Worms are also a great addition to aquaponics systems, providing available plant growth and fruiting hormones as well as many minerals. – Cassandra, The Worm Coach contributes knowledge with her Wormilicious program.